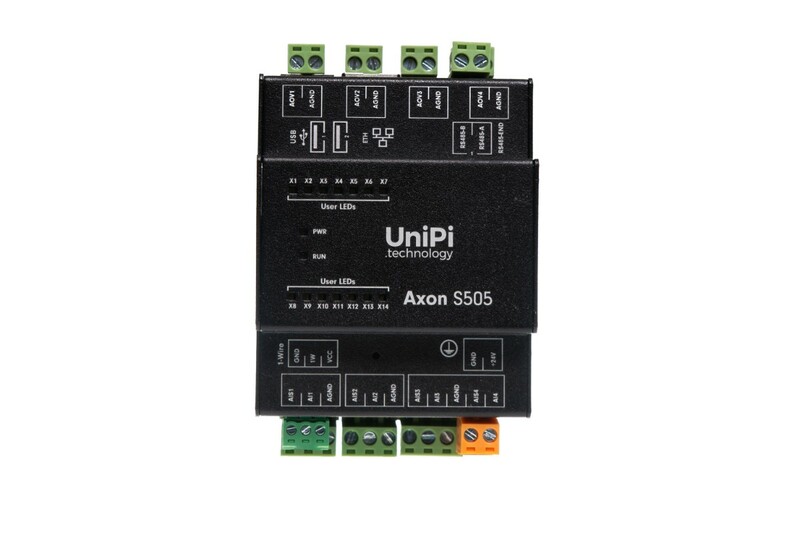 UniPi Axon S505 is a programmable logic controller (PLC) designed for control, monitoring and regulation. 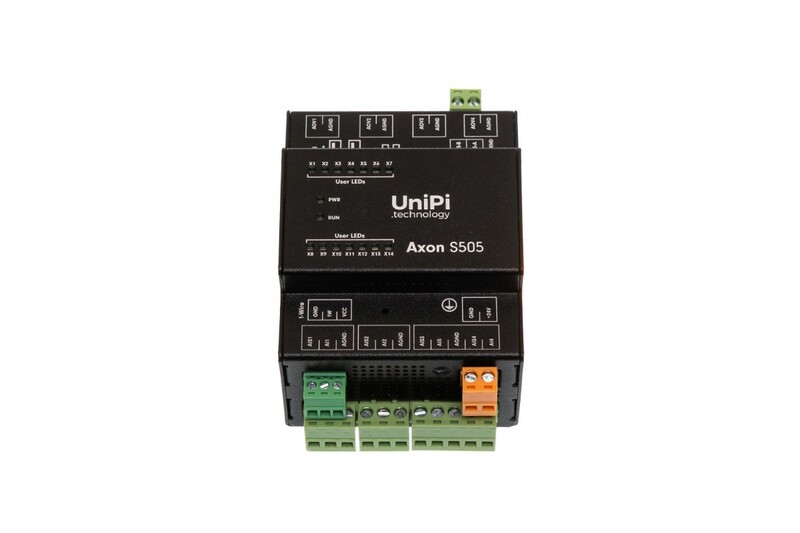 I/O architecture of S505 is focused on analogue inputs for reading voltage signals from corresponding sensors, and analogue outputs for control and regulation of various external devices. The I/O architecture of the S505 is focused on analogue I/Os. Analogue inputs can be used for automation tasks requiring either receiving of voltage or current signal for gathering data from corresponding sensors (such as resistance thermometers), while analogue outputs are designed for control and regulation of external devices such as three-way valves or heat exchangers. 4 analogue inputs (AI) can be used for 0-10V DC voltage or 0-20mA current measuring, making them suitable for reading values from analogue sensors such as temperature sensors, pressure meters, tensometers etc. S505’s analogue inputs allow the user to measure voltage, current or resistance based on current output register settings. 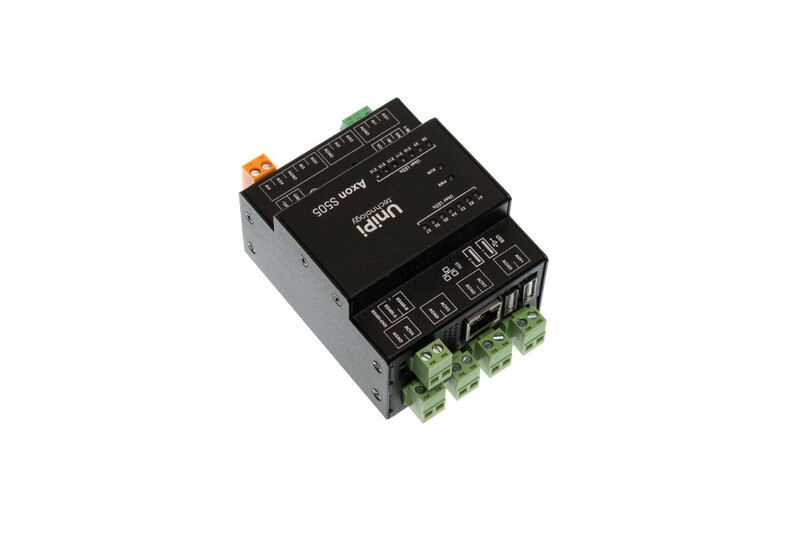 4 analogue outputs (AO) use 0-10V DC voltage for control of devices with analogue input, such as three-way valves, lighting dimmers etc. 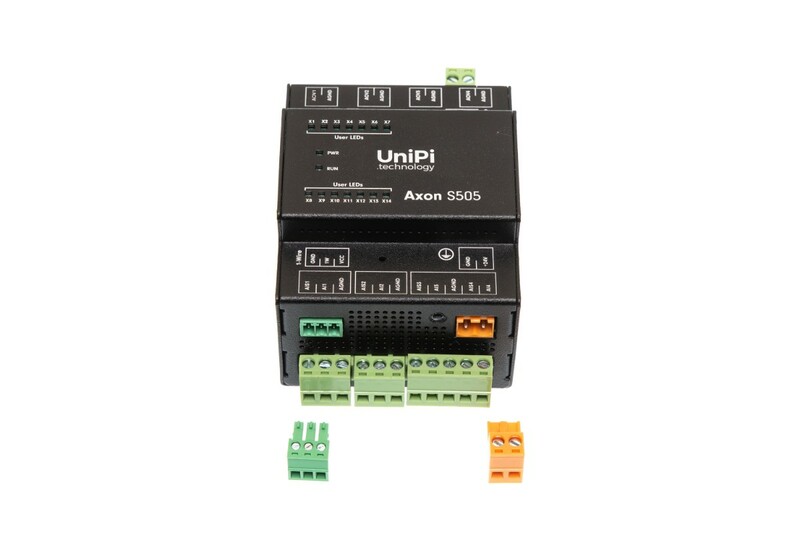 The unit features a pair of RS485 serial lines. This type of serial line most often uses the Modbus RTU protocol. 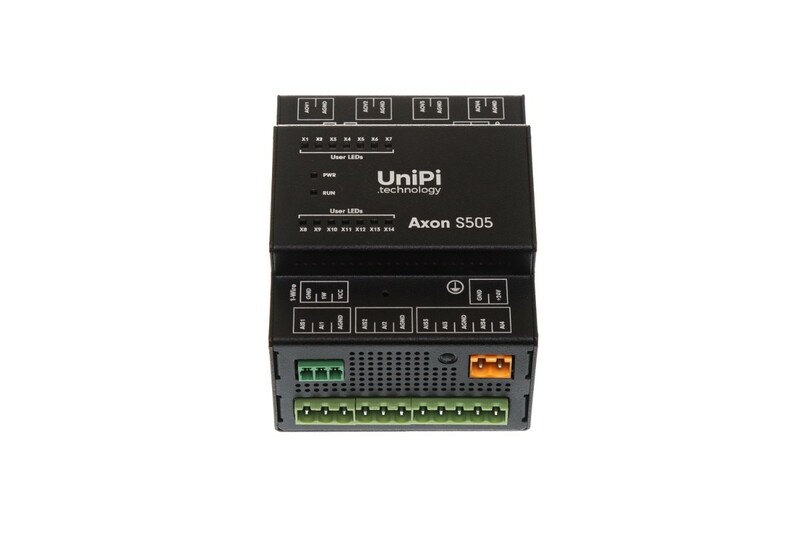 It can be used for communication with a wide variety of devices such as energy meters, touchscreen HMI panels, PLCs from other vendors or our Neuron xS extension modules. The bus can communicate with up to 32 devices with its total length being up to several hundred meters. 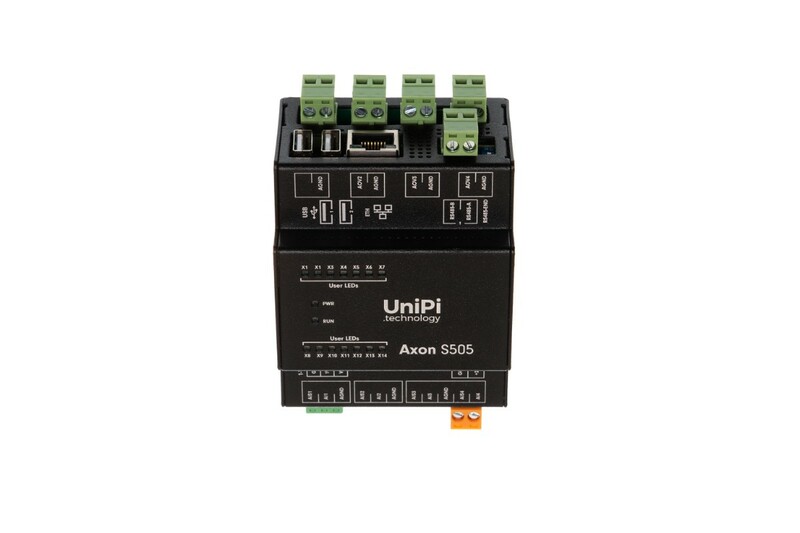 Included is a single 1-Wire bus, using 2 or 3 conductors for communication with simple sensors such as thermometers, humidity meters or light intensity meters. A single bus can communicate with up to 15 sensors with the maximum total length of the bus up to 100 meters. For network communication, a single 1Gbit Ethernet is provided. Customers can choose from a wide variety of software solutions thanks to the open nature of Axon controllers and are not limited to a single platform. Available are both professional and open-source solutions. 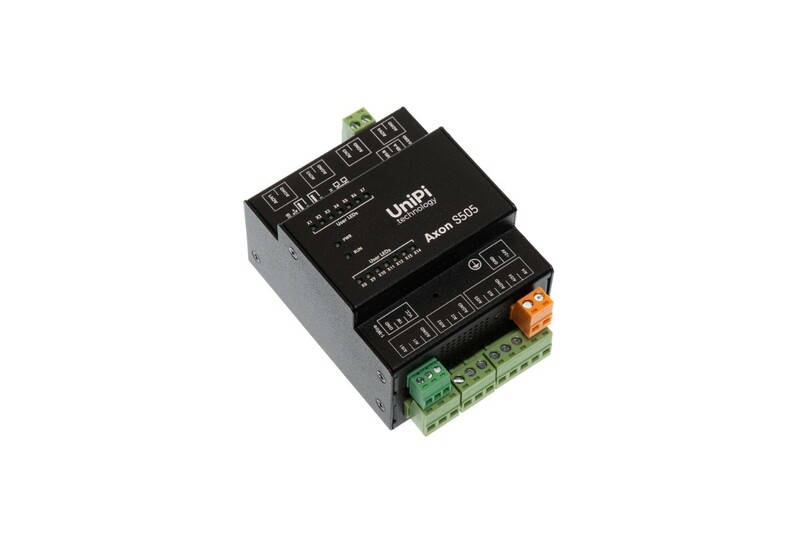 Our main supported solution for UniPi controllers is the Mervis. This platform is developed in accordance with IEC 61131-3 PLC programming standard and contaiíns SCADA interface for remote management and monitoring, comprehensible development environment, user interface (HMI) editor and online/on-premise database for data storage and retrospective operation analysis of monitored technologies. Aside from commercial platforms, several open-source solutions are available as well. Alternatively, customers can use their own code or implement Axons into already existing software solutions through the use of EVOK open-source API. Visit this link for supported software overview.